John Yeary: Color Scheme Designer 3 Rocks! Color Scheme Designer 3 Rocks! Yesterday, I made mention of a tool to help you select a collection of complementary colors based on an image you upload. The tools works well, but it pales in comparison to the Color Scheme Designer. 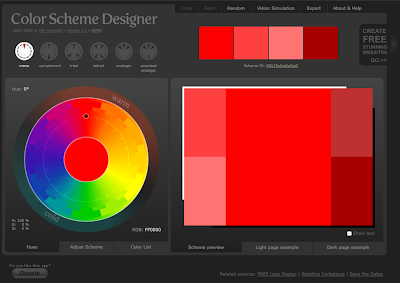 This tool allows you to pick a base color which I picked from the Color Palette Generator. From this base color you get any number of color combinations: complementary, mono, triad, tetrad, etc. It will even show you what the color combination would look like for someone with vision impairments such as color blindness. This is truly slick. After you pick your color combination, you can output it as HTML+CSS, XML, text, GPL (Gimp), and ACO (Photoshop). This is truly helpful. They even have representative web site combos with your color scheme to examine.